Our two Democratic Congressmen split their votes on the health care “reform” package that passed the House of Representatives late Sunday night. Rep. Rick Boucher voted “no,” saying the bill’s cuts in Medicare hurt his large senior citizen constituency. Rep. Tom Perriello cast a “yes” vote, a move which could cost him in the mid-term elections this fall because most polls show Southwest Virginians aren’t sold on the s0-called “reform” plan that heads for President Barack Obama‘s desk for signature this week. The 219-212 passage came without a single Republican vote and Obama bought that passage with a last-minute capitulation to Democratic Rep. Bart Stupak, a pro-life moderate who brought enough votes with him to put the bill over the top. Obama agreed to an “executive order” that would prohibit using federal funds to pay for abortions. 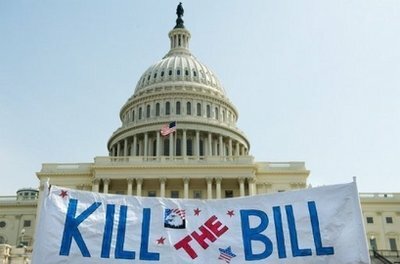 But the bill, for all its hoopla, does little to “reform” the health care morass in this country. Premiums will not do down. Most will increase. The bill not only extends health care protection to 32 million uninsured Americans — it mandates it, even if you can’t afford to pay. Failure to pay will bring a fine from the Feds. For the most part, the bill is crippled by capitulations to the very insurance companies Obama claimed he wanted to control. Obama sold out on health care reform — and he sold out the country as well. Big business is running and ruining this country. News Flash – For profit corporations long ago sold out universal, affordable health care – turning health care into a for-profit business. If you believe that corporations should be able to profit on sickness, then you didn’t vote for President Obama. America did, and America prevailed. Bob, the bill that Obama pushed and was just passed forces all of us to pay the for-profit corporations. How can you honestly say that Obama supports affordable health care. The insurance industry now has your check book and you can’t take it away. Gee, I don’t know Lauren, 32 million Americans can now afford to have health insurance, half of them living in poverty. Having just buried an uninsured family member because she never received diagnosis for her breast cancer and it spread through out her body – I’m praying that other families will be spared the decision to pay for health care, or eat. These are all people whose health care was already being paid for by others, either in higher premiums to offset their charity care in the emergency rooms, or in the case of Lola, by the taxpayers when she slipped into Medicare eligibility a few months ago. I don’t see how 32 million will be able to afford health insurance, it still will cost them a considerable amount of there income. Those who are struggling to make ends meet will have one more bill to pay. As I understand it, even those on the edge of poverty will have to pay at least 4% of their income to the insurance company. I think I’m looking at 10% of my income going to a insurance company. I might be able to make that work but there are a lot of people out there who do not have another 10% to hand over. There will be tax credits to offset the cost of insurance. And if you are buying individual insurance you will no longer be subject to lifetime limits, annual maximums, and no coverage because of pre-existing conditions. If you are very poor there will be assistance with co-payments and deductibles and subsidized high-risk insurance coverage. From conversations with my group policy provider I’m confident that I will be able to provide the same, or better health insurance for less money. But what about those of us who are young and do not have health insurance now. We have house payments, car payments, ect ect . When the pay check comes in it is already spent. I make to much to qualify for the government to completely pay for my health care. It looks like I will be required to pay about 10% of my income to the insurance company. I also believe my medicare tax will go up. What would you recommend, I default on the house or the car? Doesn’t sound like Health care insurance coverage is a priority to you. One bad injury/illness could leave you unable to work, with many medical bills, in bankruptcy, and you will lose your house and car anyway. And when you stick the doctors/hospitals with the bill, my premium will help pay for your poor decisions. I recommend that you seek health insurance from your trade group, or association, make the cost part of your budget, and build it into your rates. No it is not a priority, I put food and shelter above it. I understand I am taking a risk. If I am wrong I will lose everything. I’m not sure why that is any of your business if I go bankrupt or not. That should be my own personal decision. Whats next, do you want to make sure my house payments are suitable or if I am spending my grocery money wisely? Doug – In so far as it goes, I agree with this assessment of the bill. I don’t think we can expect government to solve the problem of health. Both government and corporations — and bureaucracies of any sort — are no more moral than the people who run them. We cannot expect either do something we will not do ourselves. Step back for a moment and look at the problem. 85 percent of public was happy with their health care as is. Our problem was and still is the fact our government was paying too much for existing government programs. Nonetheless, we still have millions who do not have health care insurance and cannot afford it. So we want the government to fix the problem by taking on more? When we are going broke, we are going to depend upon an expanded government program to save money? Since when has that worked? Sometimes there is no substitute for individual responsibility. Charity = Love. Love is an individual responsibility. No government can do it. Charity is something we each have as an individual responsibility. Sorry, I hit the “submit” button by accident… No, the bill that passed isn’t perfect but it is the 1st step towards affordable health care. Of course, anytime you have a bunch of lawyers & politicians putting something together, it becomes too convoluted. Let’s not throw away the whole bill like many of the republicans want, but tweak it to make it better for those it is meant to serve. We can only hope and pray that our representatives will put away their petty agendas and do what is right.